It's time for our Wednesday challenge over at The House That Stamps Built. This week the theme is --- ANYTHING GOES! I think this is the shortest supply list I've ever had -- mainly just RI stamps and one color of ink! The adorable puppy on the stamp reminds me of our two sweet labs --- they're definitely among the "world's most spoiled pets!" 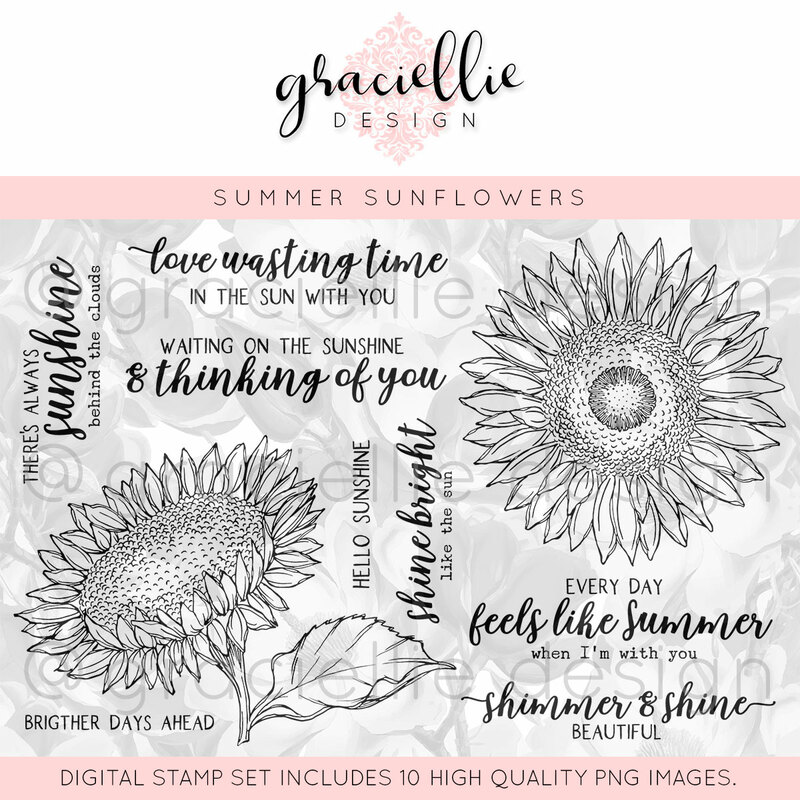 Today I have a somewhat clean-and-simple card to share with you featuring Graciellie Design's "Summer Sunflowers." One of the things I love about digital stamps is how flexible they are. You can re-size them, create a collage with them, crop them, invert or change their color, ..... and the list goes on and on. 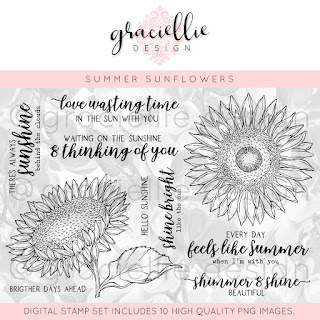 You'll notice that the image I used on today's card does NOT appear in the set Gracie has for sale ....that's because I created it myself by cropping and rearranging the flowers in the Summer Sunflowers set to make my own unique digi! Fun - right?! I created my background by stamping distress oxide ink on a narrow acrylic block I have. I spritzed it with water and stamped it on my paper...allowing the colors to run a bit before heat setting. Hello friends, I have happy news!!! Jessica Burnham has invited me to design for her digital stamp shop called Polka Dot Orchard. You'll want to stop by Jessica's store and check out all the lovely digis she has for sale. For this first card, I went for contrast with bright flowers and a black embossed background. I covered my flowers with one layer of UTEE to add a dewy texture to them.